Market women at two major Markets; Mandate Ultra-Modern Market, Adewole and Ipata Market, in Ilorin metropolis, Kwara State, have rejected the Federal Government’s Social Investment Programme, Trader-Moni. 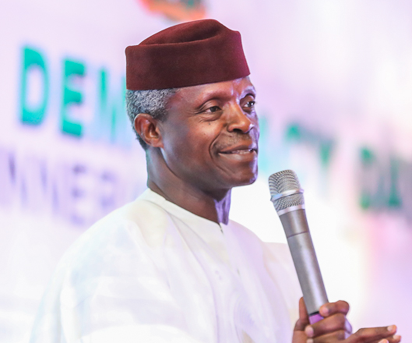 Vice President, Yemi Osinbajo, was in Ilorin, to launch the programme, on Friday, but the Market women, it was gathered, turned down Osinbajo’s offer. The Market women, according to sources close to their Leaders, told Osibanjo and those in charge of the fund disbursement, to differ the disbursement till after next year’s general elections, if their intention is genuine. The Chairperson of Market Women Association in the State, Adenike AbdulKareem Lambe, confirmed the rejection of the Trader-Moni, by members of the Association. “We doubt the intention of the Federal Government, on the disbursement of such funds at this period of electioneering campaigns, towards the 2019 general elections. “If they truly want to assist the Market women, they should come back after next year’s general elections, to disburse the funds to our members. Hajia Lambe also recalled, that Senate President, Bukola Sarak,i recently donated N5 million towards the construction of their Union’s Secretariat. She expressed the Market women’s continued support for the Senate President, saying that: “Saraki has always stood by us, and supports us whenever the need arises. It will be recalled, that the Peoples Democratic Party, PDP, in the State, had described the programme as a vote-buying gimmick by the APC-led government, ahead of the 2019 general elections. The party in a statement by its State Publicity Secretary, Tunde Ashaolu, noted that: “The scheme was launched in 2015, and in the past three years, the Vice President did not visit any State for Trader-Moni, but few months to the general elections, he has been going round Markets in different States of the country, to distribute money to Traders and Artisans. We want to believe this is not a ploy by the APC, to induce them ahead of the elections. “Nevertheless, the Kwara PDP warns against the partisanship of the initiative, and advises that there should be no discrimination in the selection of beneficiaries in the State. “The Vice President and his team must ensure that beneficiaries are selected without recourse to political affiliations. As this is a government scheme and not a party affair, beneficiaries must cut across political divides. “We demand that criteria for selection be made transparent and strictly adhered to, and all beneficiary Traders and Artisans must follow the normal procedure, irrespective of where they belong. “Trader-Moni is a programme for all Nigerians, and not just for the APC alone. We therefore, call on the Vice President to include representatives of other political parties in the flag-off ceremony of the scheme in Kwara.